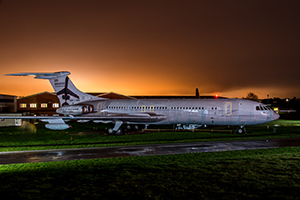 Tonight’s photoshoot was scheduled to offer both sunset and night time photography of the Cosford RAF Museums’ external aircraft, including the Bristol Britannia and the Hawker Siddeley Nimrod. 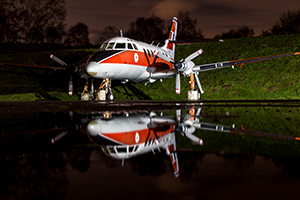 As a special edition to the event, the Scottish Aviation Jetstream, usually housed inside Hangar 1, was moved outside, giving photographers 9 aircraft to capture. Sadly, as with all outdoor events the weather can play a huge role in the success of the evening; after a stormy week there was real doubt as to whether the event would even go ahead. 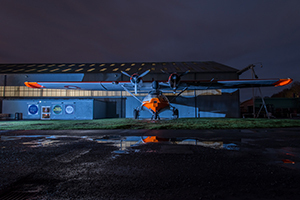 The photoshoot was run in conjunction with Threshold Aero, who run a range of aviation based events at various locations in the UK. They specialise in night photography and are well equipped with LED lights to offer an alternate, illuminated view of the subjects. After a quick briefing the eager photographers were allowed to wonder freely around the exhibits. The knowledgeable and friendly staff were on hand to offer advice to those in need of brushing up or refreshing their low-light photography skills. Similarly, the RAF museum volunteers were located at each aircraft to share their expertise on the aeroplanes and their service history. After already walking around the museums 4 hangars prior to the beginning of the event, I decided to enjoy a hot drink in the restaurant (which remained open until 8pm tonight) before venturing out. This proved to be a wise move as heavy rain and wind dominated the early part of the evening. As the darkness set in the lights were switched on a decided to brave the elements. Fortunately the inclement conditions moved through the area quickly leaving better conditions and lots of puddles for keen photographers to crawl-in for those low-angle reflections. 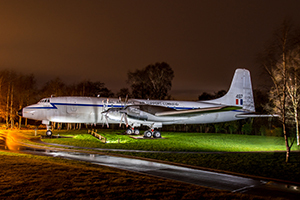 The First aircraft I visited was The Bristol Britannia; nicely lit and conveniently located in a secluded spot. The Britannia was designed for the British Overseas Airways Corporation, it made its first flight in 1952. 85 Britannias were built and the RAF used twenty-three as long range troop and freight transports. G-AOVF was built for BOAC and first flew on 18 December 1957. The highlight of its career was its use by HRH Princess Margaret on a tour of the West Indies in 1958. I then made my way down to the Hawker Hunter, an aircraft that is still remembered fondly by its pilots as a delight to fly. It served with 22 air arms world-wide. Cosford’s example is a F6A and has been standing as the museums gate guardian for some time. As such, looks a little weary and tired, but still made an interesting subject for photography. The Hunter is also placed well away from any of the other exhibits, which allowed for some nice clean shots. 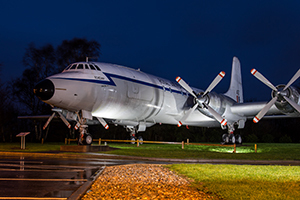 At the bottom of the museum carpark, two imposing aircraft; the Vickers VC10 and Lockheed C-130 Hercules represent a more recent chapter in RAF history. Despite their size both exhibits were lit with an interesting lighting configuration. 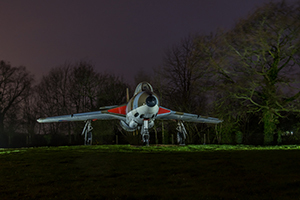 The natural banks on the museum car park gave photographers chance to get a slightly elevated view of the aeroplanes, further enhancing the photogenic nature of the two aircraft. 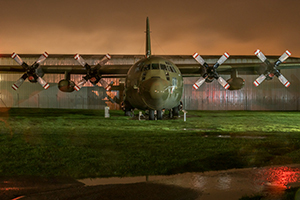 The Hercules is still one of the most widely used cargo transports in the world, the Cosford example was the last RAF C130K Mk.3 to be retired. The Vickers VC10 was well-known for its high speed cruising and excellent short runway performance. All this came at a cost in fuel which led to its ultimate demise. After exploring the lower section the rain stopped and wind eased. I decided to make my way to the top of the museum where the Locheed P-2H Neptune, Hawker Siddeley Nimrod and Dominie were clustered. All were well-lit but due to the close proximity of the aircraft patience was required to get a clean shot. The P-2H Neptune is a land based maritime patrol and anti-submarine aircraft, more than 1100 were built and no other post war maritime patrol aircraft has been built in such large numbers. 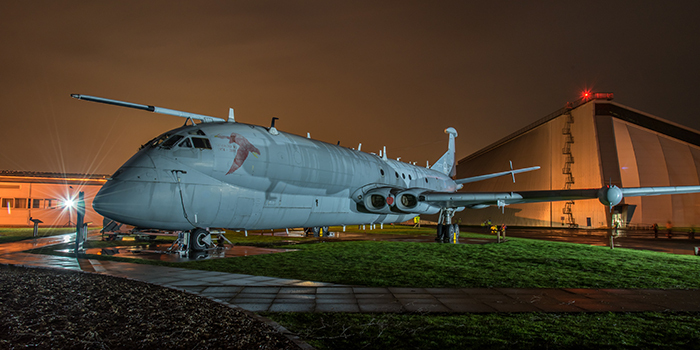 The Nimrod fulfilled a similar role and was derived from the famous Comet airliner. 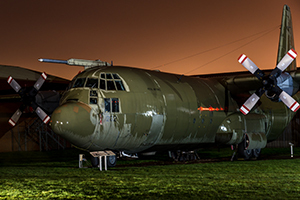 It originally entered RAF service in 1969 to replace the Avro Shackleton and continued until 2010. Finally the Dominie advanced navigation trainer saw long service with the RAF. It was the first jet-powered navigation trainer designed specifically for such a purpose, the similar British Aerospace HS125 CC 3 remains in VIP communications service with the RAF today. Better located for photographic purpose were the Scottish Aviation Jetstream and Consolidated PBY Catalina. The Jetstream served as the RAF's standard multi-engined pilot trainer for many years, and was the last aircraft of Handley Page design in RAF service. The Consolidated PBY-6A Catalina was the last version of the ‘Cat’ to be developed and was a development of a pre-war design which first took to the air in 1935. The PBY series were produced in greater numbers than any other flying boat. 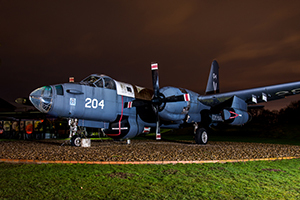 Despite the weather, the first external aircraft night-shoot was a real success; well-attended by over 140 photographers and efficiently organised. 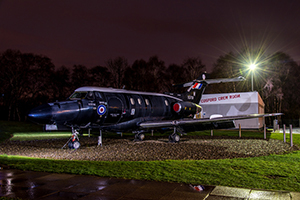 The RAF museum is free to enter and holds one of the largest collections of static display aircraft and aviation artefacts anywhere in the World. Split over two sights, one at Hendon, London and the other at RAF Cosford, Shorpshire. 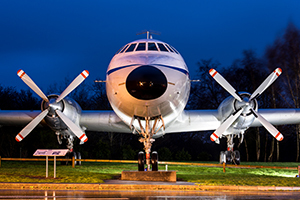 It offers something for both aviation enthusiast and members of the general public. 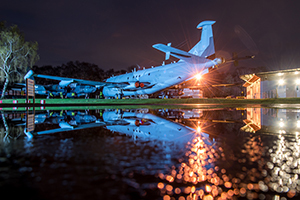 Both sites are well worth a visit at any time of year, but look out for the many events they run, such as this which showcased the external aircraft like never before.